You'd think after my craziness on wednesday I would've avoided the game arcades like the plague. I'm trying to think of my rationale, and the only thing I can think of is that it's one of the places I can go where there is zero reliance on speaking japanese. I have no problem whatsoever asking staff to move an item. So, before work I perused the arcades closest to work. I didn't play any. Just looking. After work I went to the Gento near Minato Mirai. I like some cool mugs with Japanese writing and manga girls, but the way they positioned them made it impossible to win. I went to Shibuya and looked around the usual places. One machine drew my interest. 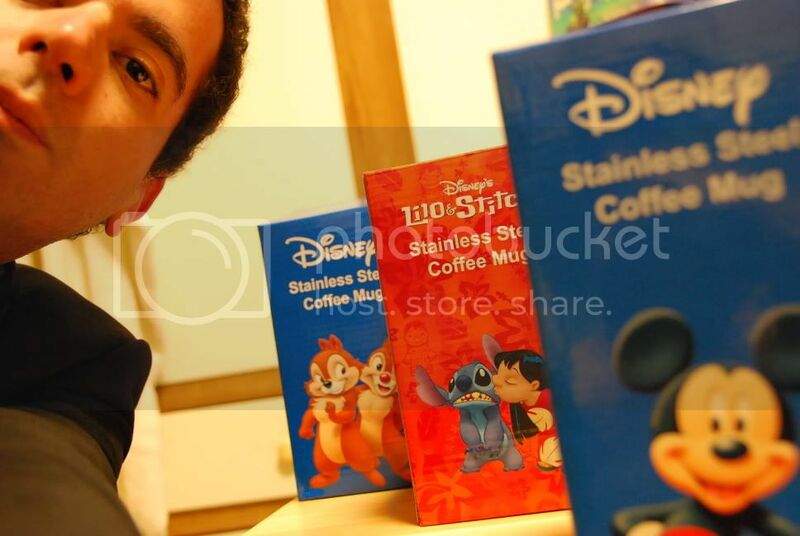 A japanese couple were winning some stainless steel Disney coffee mugs easily. The catchers claws were actually picking up the boxes and dropping them in the chute with ease. I thought at first this must be a fluke, but it happened three times! Sensing a broken machine, I thought they must have set the sensitivity on this one to "non rip-off" mode. I couldn't resist so I tried three times and got all three, 300 yen! I was tempted to keep on going, but my better judgement decided to stop while I was winning. What am I going to do with all these mugs? I may keep one box. The other two are likely to be gifts. I just have to decide which one I like the most. Big decision.